Tsuyoshi Roy Nakai has donated $60,000 over the years in scholarships to the Department of Communications. His generosity has created opportunity for many students and celebrates the life of his vibrant daughter and CSUDH alumna, Leslie. There's a 1943 photograph of a baby boy sitting on his mother's lap in the Library of Congress archives. The image was taken by Ansel Adams while he was documenting life at the Manzanar War Relocation Center in California's Owens Valley, where Japanese Americans were sent during WWII. That little boy is Tsuyoshi Roy Nakai. He was born in the camp, and he grew to understand the Japanese term used by the internees, "gaman," which means "to persevere." Perseverance has been the byword in Nakai's life. When the camp closed in 1945, his family moved back home to Lake Elsinore and ran a hot springs spa. Nakai excelled in academics in high school, and went on to become a pediatric dentist. He also became a proud father to his only child, Leslie. All had commenced as planned, until a series of life-changing events would alter his path. "In 1993, a dental chair fell and crushed two of my fingers, and one finger was amputated on my dominant hand," said Nakai. He could not be insured, so he sold his dental practice and reinvented himself with a career in computer software and put his energy into being Leslie's dad. He went to her soccer and tennis games and encouraged her as she worked toward her undergraduate degree in communications at CSUDH. 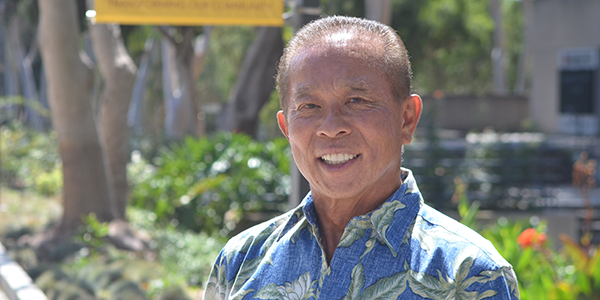 "Leslie had a wonderful time at Dominguez Hills," said Nakai. "She wanted to work in radio and television." She graduated in May 2000, and just seven months later, at the age of 25, she suffered a heart attack on Thanksgiving Day and died 11 days later. Leslie had a lifelong heart condition, but several successful treatments and surgeries had allowed her to be very active throughout most of her life. Her death was a terrible shock. "I lost my way after that, and went into therapy," said Nakai. He had to find a way to bring, "gaman" back into his life. If you met Nakai today, you would not imagine the tragedies he has endured. In the last 15 years, he turned his anguish into purposeful acts by helping others. In 2009, he published the self-help book, Elephant a la Mode: An Epicurean Guide to Life. The title is a a play on the old joke: "How do you eat an elephant? One bite at a time." The book includes notes to Leslie, filled with life lessons. He followed it a year later with more "father's insights" in his second book, Oh Butterfly, By the Way. He founded a summer camp for children and is an avid supporter of Rady Children's Hospital in San Diego and The San Diego Foundation. In 2001, Nakai established the Leslie Nakai Memorial Scholarship Fund at CSU Dominguez Hills. Since that time, he's donated $60,000 toward the fund, which provides $5,000 in scholarships to communications students each year. Ultimately, his trust will provide annual donations in perpetuity to CSUDH through The San Diego Foundation. "Leslie got a lot out of attending Dominguez Hills, and I want to honor her memory," he said. "I present the award to the students at the communications banquet, and I meet every recipient. I know the scholarship is meaningful to them." Nakai hopes the financial assistance these students get from Leslie's fund will help them to persevere in lifethe gift of gaman. "My aim is that because someone helped them, these students will also give back. Each person's small contribution adds up."